Alzheimer’s Care | Home Care Services | AHI Group, Inc.
Over 4.5 million people in the United States and 26 million worldwide suffer from Alzheimer’s disease. Alzheimer’s disease is the most common type of dementia. The disease destroys brain cells and symptoms can include confusion, anger, mood swings, language breakdown and long-term memory loss. Caring for a person with Alzheimer’s disease involves specialized services that differ from other types of senior housing. What is the best type of care for a loved one with the disease? 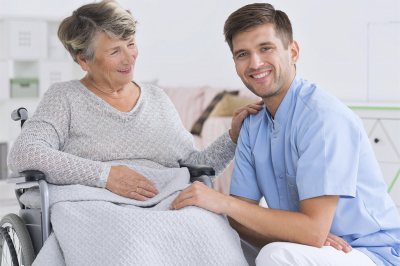 Alzheimer’s care is often delivered in an assisted living or nursing home setting usually in a separate floor or unit. Generally, the residents live in semi-private apartments and have structured activities delivered by staff members trained in Alzheimer’s and dementia care. Most of these living environments have secured areas to prevent wandering, a common symptom of the disease. Often, residents have access to outdoor walking paths or gardens which are within secured areas. Stand alone memory care communities called Alzheimer’s special care units or memory care units also exist to better meet the specialized needs of residents with the disease. These memory care communities have been designed specifically for seniors suffering from Alzheimer’s disease or dementia and often have features like a circular layout to ensure a resident won’t encounter a ‘dead-end’ in a hallway (a potential source of stress for advanced cases of Alzheimer’s). When making a decision, it is important to ask if there is specialized care offered for residents with Alzheimer’s disease or other forms of dementia. You can find communities that offer specialized care by contacting one of our Eldercare Advisors at toll-free 877-201-4008.